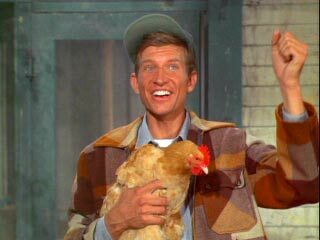 After Eb fixes Alice, the chicken's, broken egg maker and cures Arnold, the pig, of the Shim Shams, Lisa convinces Oliver to send Eb to college to become a vet (a lifelong dream of Eb's). Lisa and, surprisingly, Oliver, both find that the farm just isn't the same without Eb, and decide that they should go visit him. They don't get the chance though because Eb returns from college (10 hours after having left FOR college) and explains he was "kicked out" after missing one question on the entrance exam..."What high school did you graduate from?" 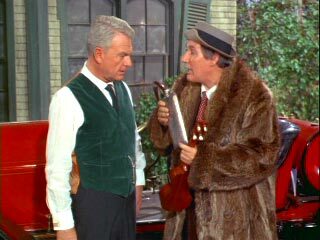 Eb fixes Alice's "broken egg maker"
Mr. Haney tries to sell Oliver a "College Kit"
Mr. Haney's "College Kit" consists of one Stutz-Bearcat, a raccoon coat, a Ukelele Ike Ukelele, and a genuine Elliot Ness hip flask filled with non-alcoholic dandelion wine. Anybody can learn to make their own non-alcoholic dandelion wine. All you need is the proper ingredients, patience, and some bulk glass bottles to store the wine in. Glass bottles of dandelion wine can even be given as gifts and are so much nicer than Mr. Haney's hip flask.